U.S. Air Force Capt. 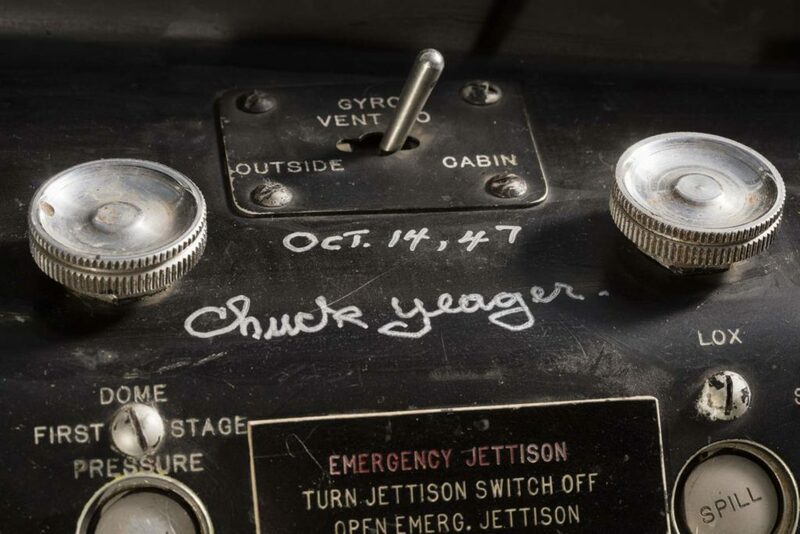 Charles E. “Chuck” Yeager’s signature inside the cockpit of the Bell X-1 “Glamorous Glennis.” The signature is dated the same day as his record-breaking flight of October 14, 1947 when the Bell X-1 became the first airplane to fly faster than the speed of sound. Yeager flew the X-1 to a speed of 1,127 kilometers (700 miles) per hour, Mach 1.06, at an altitude of 13,000 meters (43,000 feet).The Bell X-1 has been on display at the Museum since it opened in 1976. It was displayed prior to that in a temporary building known as the “Tin Shed” behind the Smithsonian Castle. Yeager has visited the aircraft often and signed the interior multiple times.